- Measures: Width: 095 cm Depth: 059 cm Height: 220 cm Weight: 500 kg - 2 year guarantee! - Free Shipping! 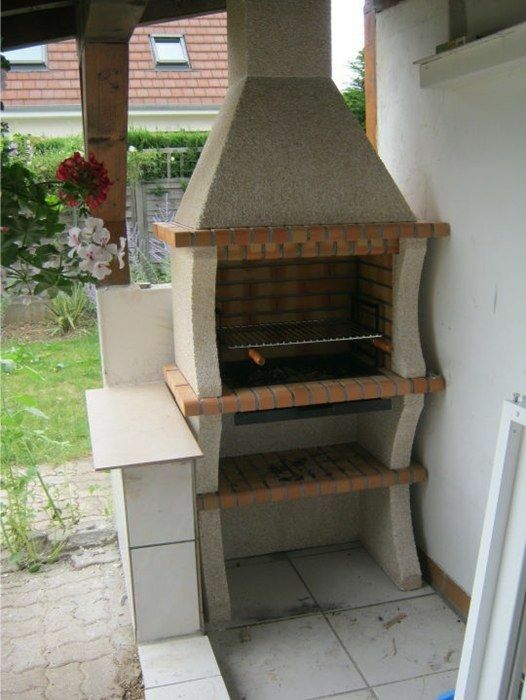 Brick Barbeque AV310B. Free shipping to England, metropolitan France*, Monaco, Belgium, Luxembourg, Italy and Spain. For other destinations please contact us. "Char grilled prawns with aioli"
1. Place the prawns, oil and lemon juice in a shallow dish and toss together, set aside to marinate. For the aioli, crush the garlic and sprinkle over the salt, rub to a smooth paste with the edge of a knife, set aside. 2. Place the egg yolk and mustard into a small food processor. Slowly, drop by drop, add the olive oils. Pulse until the ingredients become a thick paste. Stir in the garlic and lemon juice and plenty of ground black pepper. 3. Cook the prawns over hot barbecue coals for6-8 minutes, turning once until charred on the outside and cooked through. 4. Serve with the aioli and wedges of lemon and a few salad leaves.